Why did the Wine Enthusiast recently name Lodi, California, the Best Wine Region of the Year? There are so many reasons. 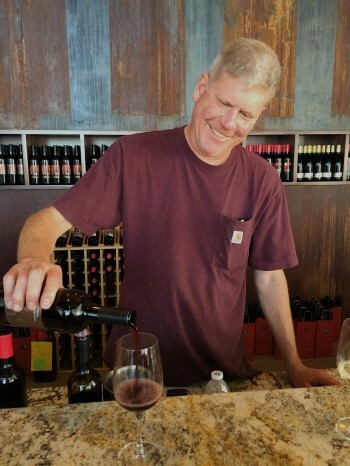 We were not surprised because last fall, right before this announcement was made, we visited Lodi for the first time and we left overwhelmed with the quality of the wines and the appeal of the area as a wonderful destination. On a trip from Southern Oregon back to our home in Southern California, we stopped in Lodi for two nights. Lodi is 90 miles from San Francisco and only 35 miles south of Sacramento. Located between Interstate 5 and State Route 99, it is easily accessible from almost anywhere in California. Our host was Courtney Smear (now Courtney Harvey) from Visit Lodi, a division of the Conference & Visitors Bureau. We had one full day in Lodi and Courtney packed our itinerary with a tantalizing sampling of what Lodi has to offer. As a result, we will be back. There is so much more to do and see and taste; however, we did a lot in one day and you can too. 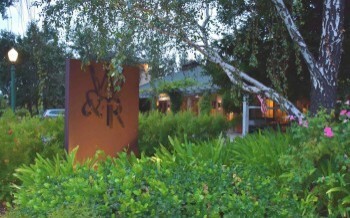 We loved the rustic ambiance and charm of Wine & Roses, a luxurious, boutique hotel in the heart of Lodi. Each room or suite is distinctively designed. Ours was inviting and beautifully decorated with warm, vibrant colors and featured every amenity you could desire. The bed was "oh so" comfortable and the linens were the best. We stepped out to a patio where we could sip wine under a canopy of trees. This is one of the most enchanting places we’ve ever stayed. We savored both breakfast and dinner in the hotel’s wonderful Towne House Restaurant, which focuses on innovative, seasonal dishes made with mostly local ingredients. Before and after dinner, we happily relaxed while enjoying original handcrafted cocktails in the Lounge, where each night talented musicians played the piano and sang some of our favorite old tunes. We also had dinner the next night at the Rosewood Bar & Grill, another outstanding restaurant in Lodi, owned by Kathryn and Russ Munson, who also own Wine & Roses. Rosewood is a farm-to-table restaurant also focusing on locally sourced ingredients. (This local focus is only logical since Lodi is such a rich agricultural area.) The chef from Wine & Roses, Leland Garner, had just moved to Rosewood, where we had a superb meal. A friend of ours had raved about Wine & Roses as the magical site of her son’s wedding. Now we know why. It is truly a one-of-a-kind place and it’s worth going to Lodi just to stay there. 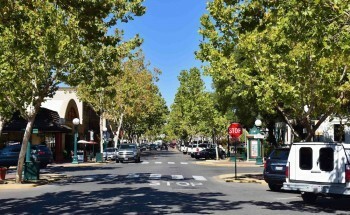 Lodi’s downtown area is pleasantly walkable and offers a variety of enticing shops, restaurants and other stops. One clever and enjoyable stop is the Double Dip Gallery, appropriately named because it is an art gallery that also serves ice cream. We met the congenial owner and founder, artist Tony Segale, who opened the gallery two years ago. The gallery displays his work and that of other area contemporary artists and also offers classes in drawing, sketching, watercolors, brush lettering, and gold leaf. And while you’re contemplating the art, why not have a milk shake or ice cream cone? The gallery’s ice cream is from Gunther’s, a famous Sacramento ice cream shop since 1940, and we can attest to how delicious it is. 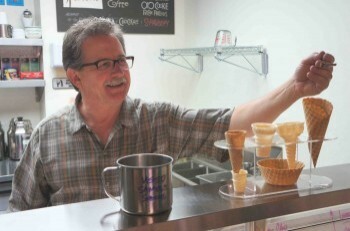 We sampled bing cherry, coconut pineapple, salted caramel and pecan praline—just a few of the many flavors the gallery offers in cones or cups or hand-packed in pints. quarts and half gallons. The combination of art and ice cream may seem unusual, but they work together beautifully at Double Dip. We enjoyed samples of a few of the 80 to 100 varieties of cheeses the shop carries at one time, including a Double Crème Brie from France and some delectable seasonal cheeses, such as Sage Darby, Shropshire Bleu and Rouge River Bleu whose home base we had recently enjoyed visiting in Medford, Oregon. The shop also carries enticing products that complement cheese, such as locally produced vinegars, oils, craft beers and wine. Cindy says, “If it doesn't accompany cheese we don’t have it.” We tasted a delicious pumpkin marmalade on brie and can attest to this treat’s lovely combination of flavors. We also savored a spicy, apple garlic jam. 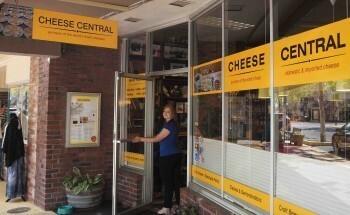 Cheese Central is a must-stop durimg any visit to Lodi. 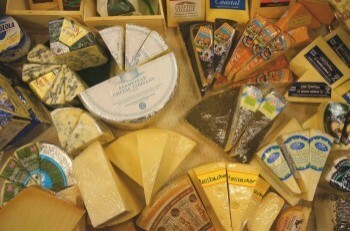 After all, cheese and wine are a match made in heaven and the best of both are found in the area. After enjoying a delightful lunch on the patio of The Dancing Fox, a welcoming family-owned restaurant, bakery, winery and brewery, we began our afternoon of wine tasting. Now we were about to find out why Lodi was named Wine Region of the Year by the Wine Enthusiast. 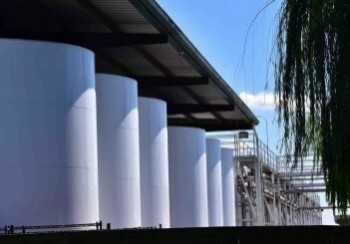 In a year when California is experiencing a record-setting drought, how could Lodi emerge as the winner? 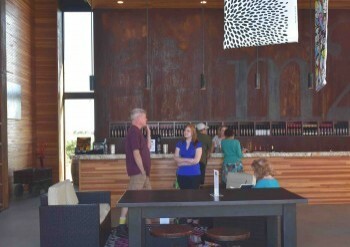 Simply, it’s because the wines are so good, the wineries are so innovative, and the tasting rooms are so inviting. We experienced this firsthand. The Lodi region, which grows more grapes than Napa and Sonoma combined and is the largest Appellation in California, has been nurturing grapes since the mid 1850s and is known for having some of the country’s oldest vines. 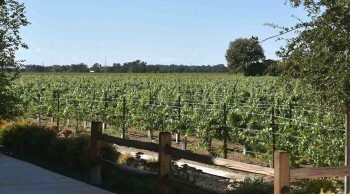 For many years, the area’s 110,000 acres of vineyards have supplied grapes to wine growing regions all over California. With the perfect Mediterranean climate of warm days and cool nights, creating a substantial temperature differential, and its rich, loamy soil, it’s no wonder the region has more than 750 growers. But in the past 15 years the region has also started producing its own stellar wines. Now more than 85 wineries, many of them small and family owned, are establishing their own reputations for producing some of the best wine in the country and even the world. Known particularly for its Zinfandel, Cabernet Sauvignon, Merlot and Chardonnay, the area continues to expand its varietals. Courtney took us to tastings at three outstanding wineries, but these were only a sampling of what the area has to offer. That’s why we will be back. There is so much more to taste and savor. Michael David Winery is one of the most well-known wineries in the region, primarily because of its much celebrated Seven Deadly Zins, which is the best selling Zinfandel in the country. Owners Michael and David Phillips are brothers whose family has farmed in the region since the 1950s. They now represent the 5th generation of grape-growers with the 6th generation moving up fast. We were fortunate during our tasting that owner Michael Phillips stopped by to chat with us. 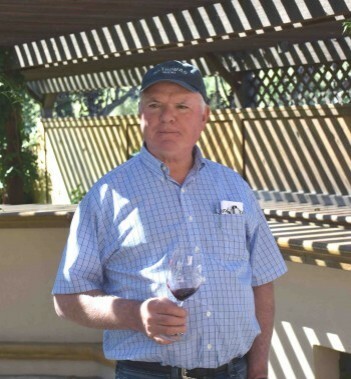 His passion about his family’s wines was palpable, as he talked about their commitment to sustainable farming practices in producing excellent wines. We tasted several wonderful wines at Michael David. The 2013 award-winning Chardonnay, fermented in both oak and steel, was rich and crispy with tropical fruit flavors. The 2014 Incognito Rouge is a creative blend of seven reds, with Syrah dominating, and was deliciously full of berry and plum tastes. The 2013 6th Sense Syrah, produced from one of California’s oldest Syrah vineyards, is full of blackberry, earthy, peppery and even tobacco flavors that made it distinctive and lush. The 2012 Freakshow Cab (love the name and label) was unique with a floral bouquet, and pomegranate and berry tastes infused with subtle oaky, smoky flavors. 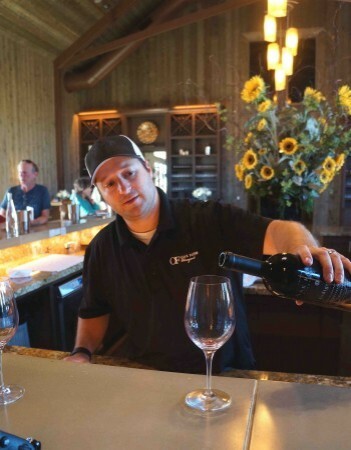 We next visited Oak Farm Vineyards and met its personable owner, Dan Panella, who explained that his 70-acre property nourishes 14 grape varietals, along with majestic century-old oak trees that give the winery its name. The winery opened in 2009, but the spacious and welcoming tasting room with picturesque vineyard views has only been open for about a year. We tasted so many great wines here. We first tasted a 2014 Bordello, fermented in stainless steel, which was crispy and light with mellow fruit flavors. Dan aptly described it as a nice “summer sipper” and we agreed. The 2014 Chardonnay had aged in French oak for about a year and had lovely pear and apple tastes with nice minerality. The 2014 Corset’s jammy berry tastes came from a luscious blend of Grenache and Petit Sirah. I especially enjoyed the Tievoli (“I Love It” spelled backwards), a luscious red blend of Zinfandel, Barbera and Petite Sirah. And 2014 Indigenous was a beautiful deep red 100 percent Zinfandel that was elegant with hints of raspberry on the palate. I could imagine pairing this wine with grilled chicken or creamy pasta, but all these wines seemed food friendly. m2’s wines definitely reflected Layne’s focus on excellence, as he enthusiastically guided us through a wonderful tasting. We enjoyed the 2014 Viognier with its fragrant, floral nose and mellow flavors of citrus and stone fruit. The 2013 Trio Red Blend of Cab Sauvignon, Syrah and Petite Syrah, tasting of berries, raisins and plums, would go well with grilled meats or spicy tomato sauce . We particularly enjoyed the 2013 Old Vine Zinfandel from the Soucie Vineyard with its intense, rich tastes of dark cherries and even hints of chocolate and coffee on the nose. This wine went down smoothly and had a lingering, elegant finish. All the wines we tasted at m2 were nicely balanced and distinctive. We bought a few bottles from all these wineries and are really enjoying them. They remind us of our very special day in Lodi. We’re looking at the 2016 calendar now to decide when we can go back. We were happy to learn that the 2016 Wine Bloggers Conference will be held in Lodi in August and we plan to be there. 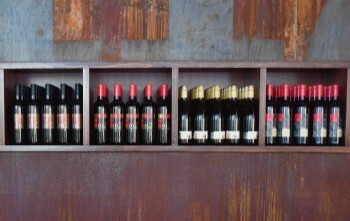 Lodi is a special getaway destination for anyone who loves good wine and good food and that’s us. For more information on traveling to Lodi, go to the website for Visit Lodi.